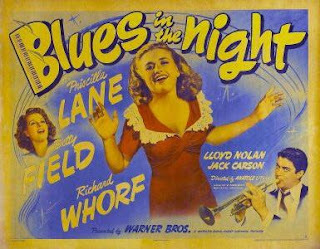 Noir(ish) of the day was 1941's 'Blues in the Night'. Not strictly a Noir but an early goofy musical comedy, vaudevillian melodrama that skirts with the black arts of noir in its depiction of venality, alcoholism, several men's obsession with a gun blasting femme fatale, gambling addiction, cash-obsessed convicts on the run, juke joints, roadhouse dives, a miscarriage and a three month stint in the psycho ward. Judged by modern standards this movie is all over the shop. Taken on its own terms it rollercoasters at breakneck pace through a dozen, occasionally thrilling, set pieces. A particularly dazzling hallucination sequence sets it apart from more mundane 'B' movie fodder. Anatole Litvak with central performances from future Director's Richard Whorf and Elia Kazan. 1950s and 60s US TV stalwart, Betty Field is suitably coarse and unlikeable as the nihilistic femme fatale. Inevitably, all of the male characters, at some point, fall for her charmless charms. Noir scale - light grey with splashes of jet black.